Eleveight Footstraps Airgo The Eleveight Airgo is easy and quick to mount. 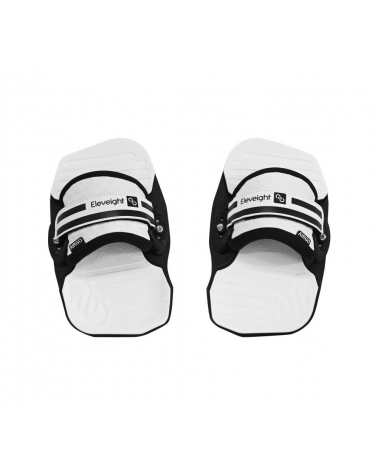 It offers a variety of settings for the perfect comfortable fit. Eleveight Tabla Kitesurf Surfboard Curl The Curl is a high-performance surfboard ideal for solid wave conditions. Eleveight Tabla Kitesurf Surfboard Escape The Escape reflects the need of a new generation of strapless freestyle. Eleveight Tabla Kitesurf Twintip Process Cutting through chop, cushioning heavy landings and easy upwind performance are only a few of the attributes that make the Process board stand out. Eleveight Tabla Kitesurf Twintip Master This board is easy to access and will provide joy and fun the second you hit the water. Eleveight Trainer Kite Our Eleveight Trainer Kite is perfect for newcomers to enter the sport of kiting. It allows anyone to learn how to handle a kite in a safe and enjoyable way. Eleveight Kite RS Series Tame any storm, ride any spot and excel in any style – the RSeries is the one kite to truly stand out in every situation. Eleveight Kite WS Series The WSeries is a true wave kite. It is a very light but tough three strut kite with a four line Open-C Hybrid design matched with a medium aspect ratio. Eleveight Kite FS Series The FSeries is a high-performance kite addressed to advanced riders that seek the thrill of radical freestyle tricks and staggering big airs.